LEGAL DISCLAIMER: The following is a work of fiction, and I do not in any way claim ownership of the Annie franchise or its characters, created by Harold Gray, Charles Strouse, Martin Charnin and Thomas Meehan. Shortly after the events of the musical storyline, Annie is the girl who has it all, but still feels a void in her. Turns out that forgiving the woman whom she loathed was just the thing she needed. It felt like a dream come true. A Cinderella story, so to speak. One day you were an impoverished orphan girl, yearning for your real parents to come back and embrace you with open arms; sooner or later you are now in the care of the richest man the world has ever seen. I asked Molly to pinch me as I may have been in a dream or worse, but it was true, it was real. From grubby hand-me-downs donated by the Salvation Army to dresses my adoptive father willfully bought off Bergdorf Goodman. And yet despite the luxury I've had experienced since my adoption, wearing that red and white velvet dress I became so known for throughout the whole of New York City, I never got too consumed by my newfound wealth, unlike that snob Myrtle Vandenmeer whom the teachers at P.S. 62 expressed their favoritism. I always told myself to keep my head low and not to forget about my past, especially as my Daddy Warbucks came from an equally impoverished background himself, having being orphaned since he was about my age. I felt that explained the bond that developed between him and I, in that both of us have pretty much been on the same boat after all. I may have won the fight and got it all, but there's this gut feeling that something is missing. Material wealth can get you so far, but there's still a void left in me, there's still a job left unfinished. And by that I meant my real parents, David and Margaret Bennett, whom I've sadly had the misfortune of not having spent my childhood with for a decade. Twelve long years. I may have moved on somewhat, but I still yearn to at least pay my last respects to them. And if there's anything else, to be able to forgive the one whom my friends at Hudson's Home for Girls and I experienced misery, woe and unjust drudgery. It's hard given the circumstances, but I really do hate to hold a deep-seated grudge as this isn't what Mom and Pop didn't want me to grow up with. Anne Bennett may have been a tomboyish bruiser, ready to exchange fists when need be, but she sure isn't one to be a cold-hearted young lady. We were having a stroll in Manhattan when I asked Daddy if we could head over to the New York Women's House of Detention, where Miss Hannigan was currently detained in. "I see you finally had the heart to have a little forgive-and-forget," said Daddy. "I guess..." I replied meekly. "We're having a detour, Drake, take us to the detention facility," ordered my father. "Daddy, I've had this gut feeling in me... I've been through so much abuse and all, yet something tells me there's still hope to the matron whom Molly and I loathed back at the orphanage," I confessed. "Well I'm glad you grew up to be an upstanding and humble young lady, Annie," praised Daddy. "Mercy is one thing that sets you apart, my dear. You've been through and all, and when given the chance, you forgave. Always." "Part of me wanted Miss Hannigan to rot in jail, but broken as she was, how could she hurt me?" I cried. She sure was an unpleasant character along with her brother Rooster and his girlfriend, but she was a product of her society. Perhaps Agatha may have turned up to be a better citizen should she be in a different circumstance? A few minutes later and we arrived at the facility where Hannigan and other female detainees are paying their dues. It was harrowing to say the very least, perhaps far worse than what myself and the others experienced under our matron's care (or lack thereof). I guess I was lucky then. Daddy, Drake and I disembarked off the Duesenberg, and we were escorted to the reception area where Daddy asked if we could pay a visit to Miss Hannigan. "We'd like to have a few minutes with Agatha Hannigan, please," ordered Daddy. "Will do, Mr. Warbucks," the clerk complied. We were led to a block where Hannigan's group was detained in. Poor Agatha felt alone and miserable, suffering from alcohol withdrawal and depression ever since she lost her position at the orphanage whom she was usurped into no thanks to a relative of hers. It didn't help that her brother Rooster got a life sentence for a major heist he and his cohorts pulled off at one time, out of sheer desperation due to the Depression. "You have a visitor, Agatha," said the warden, "A former orphan of yours,"
"Annie, I see," said Miss Hannigan glumly. She was then escorted to the visitor's cubicle where we were separated by a wire mesh window. "Good day, Miss Hannigan," I greeted. "Likewise," replied Miss Hannigan. "I guess your Daddy has given you everything at the mansion then. You won, Annie, you and your friends. And here I am, living in misery and pain,"
"I'm sorry," I sympathized. "I didn't mean to be rude to you either. I just had to stand for myself and my friends. I should be the one who should apologize,"
"Why would you even need to forgive me, Annie? You've been through hell and back! I deserved nothing from you!" "Rest be assured that you'd be given a parole in no time, Agatha," said Daddy proudly, being the well-connected man that he is. "I'm afraid you'll have to save that for a deserving felon, Oliver," Miss Hannigan deferred, "If anything, there's this purgatory that I have to live through for now. I can't call myself a free woman as it is,"
"No, thank you, Mr. Warbucks. I've made up my mind,"
"Well, if you say so. But I'll do what I can to make you feel better here in jail, believe me," assured Daddy. 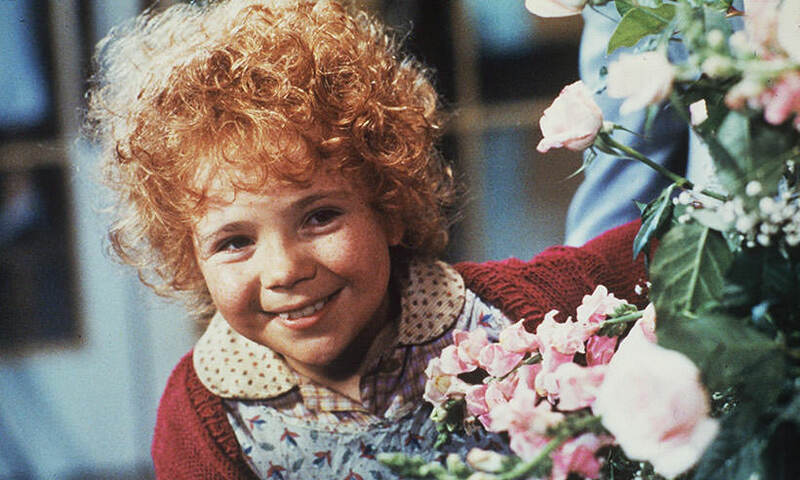 Miss Hannigan let out a faint smile, having being cheered up for the first time since she was incarcerated. "Annie, I have a confession to make," confessed Agatha, "There is a letter your father wrote shortly before he died. The landlady at your old place kept it from what I heard. If there's any consolation for what I have done to you, dear, I'm sure this would atone for how I've been cruel to you and your friends,"
"Yes, really," replied Miss Hannigan, "Now be a good girl and pay Miss Riley a visit. Tell her you came for a letter your parents wrote. I'm sure that would give you that closure you needed,"
"Time's running out, Hannigan, visitation time's almost over," grunted the warden. "Well I guess I gotta' go for now, Annie,"
"Sorry about that, Miss Hannigan," I said. "Please, call me Mommy Agatha instead, there's no need to be too formal,"
"Don't worry, I'll write you whenever I can, it'll be alright,"
Needless to say, I left the prison with a thorn taken off my back and a smile in my face, being assured that all is forgiven. We then paid a visit to Rose Riley, the landlady of a boarding house my real parents and I used to reside in when I was a baby. "You're Rose Riley, I presume," asked Daddy. "Why yes, I am, Mr. Warbucks, come on in!" greeted the landlady, "So what brings you here?" "I presume you know Agatha Hannigan, right?" asked Daddy. "Ahh, you mean that old hag?" Riley scoffed. "Heard she got jailed for fraud and child abuse lately,"
"Well, there is that, but we paid a visit to her on Annie's request," Daddy elaborated, "She felt despondent and depressed for the crimes she committed, to say the least. Annie didn't want her to suffer though, and I can tell from the woman that she's sorry,"
"Oh my!" Rose exclaimed. "I'm glad your daughter still has the heart to make amends with the woman whom she had a hard time with,"
"True, true," said Daddy. "You see, that brings me to another reason why we came here. Agatha mentioned a letter that Annie's parents wrote before they died,"
"Kinda' surprises me that the G-men overlooked that one," said Rose, "I have it here,"
Rose passed it to Daddy, whom the latter handed over to me. Tears welled out of my eyes the moment I saw the letter. I tried to fight them back, but it stung me too deep. By the time you have read this letter, we would most likely be gone by now. I know you would be saddened and most especially be heartbroken by our absence, but dire circumstances have forced us to give you up, even though you, as a wee little lass, would at a tender age be facing a dark and sinister surrounding ahead. We wished we would be together as a family, but even if that sadly did not come to pass, rest be assured that you will soon be in good hands, and we will always be there to guide and inspire you, no matter where you are. It fills us with pride that you have grown up to be a strong yet caring young lady, and that you have never given up on your journey in life. And we hope that no matter how stormy life may seem, the sun will soon come out tomorrow. Never have I felt so immensely relieved my entire life, and to say the least, this dark chapter in my life has finally been over. But I also had to pay my respects as well - Rose led me, Daddy and Drake to the cemetery where my real parents were buried, thanks to Miss Riley's generosity as she was able to get his friends and relatives to pitch in for giving my Mom and Pop a proper burial than an unmarked pauper's grave. I prayed for their eternal rest and left a bouquet of flowers; Daddy promised to build a lavish mausoleum for them, but knowing my inner sense of modesty we settled for something sedate yet dignified. "I guess I really am lucky," I said to myself. A/N:Portions of the fic were inspired by Lemony Snicket's A Series of Unfortunate Events as shown by the title and the letter in question. That brought tears to my eyes to say the least, so I decided to remix it a bit and apply it to the Annie story. I've also incorporated portions from BioShock 2, particularly when Eleanor Lamb expressed her willingness to forgive her mother should the player spare all key storyline characters.